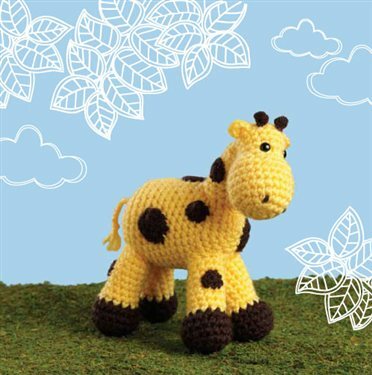 I would like to introduce you to Ellie the Giraffe who stands at a staggering 8½” tall. Ellie loves long walks across the African plains and is looking for someone to love her. (dark brown; MC), 1 ball. Notions: Stitch markers (m); yarn needle; two 9 mm black safety eyes; polyester fiberfill. Gauge: 14 sts and 16 rows = 4″ in sc. Gauge is not critical for this project.